ValueTool: how much are your stocks really worth? A display system for providing financial information regarding publicly traded securities includes a display having seven valuation metrics related to a publicly traded security displayed on a scatter chart. Each metric may be selected to permit a user to view detailed information concerning the metric. A user may successively drill down in the displayed information to obtain finer and finer detailed information related to the security. The display system also provides a comparison of the valuation metrics of several selected securities. Either outright sale or licensing with royalties. Software has been previously marketed with limited commercial success, although significant market niche still exists as complement to other fundamental analysis or charting software, or as iPhone app. Web site valuetool.com exists but is dormant. 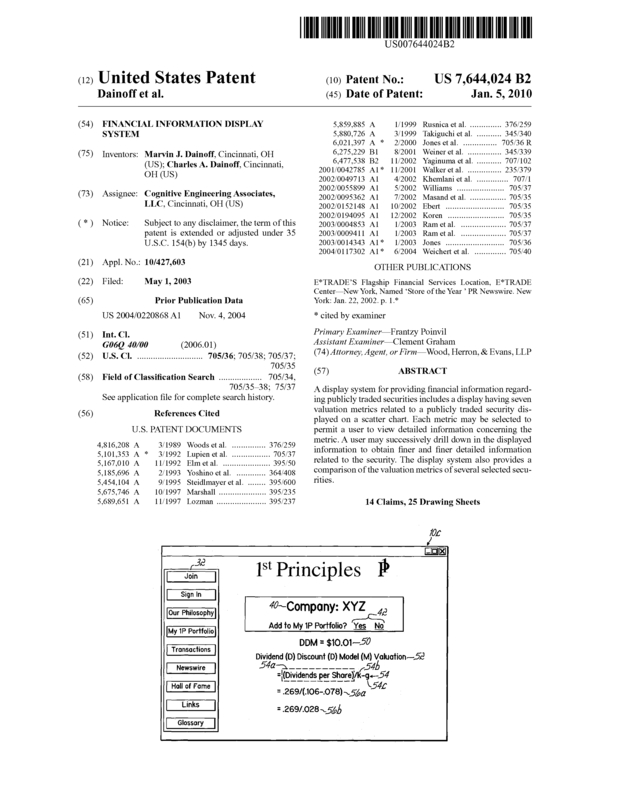 Page created at 2019-04-24 18:21:43, Patent Auction Time.